Public health is a fascinating area of study for a lot of reasons. While it’s important enough that nearly every state has at least one school offering a master’s in public health, it’s still niche enough that in many cases that one school represents the only option in the entire state. This means that for many prospective grad students, the type and quality of education available up the street can be considerably different from what is found in other parts of the country… making options that actually stand out in side-by-side national comparisons very limited, or even nonexistent. This is an important thing to consider given the global nature of public health in the 21st century. While there will always be extremely important work to be done even in the smallest of American communities, there is rarely an issue in public health that isn’t in some way connected to what’s going on in other parts of the country, or even the world. Similarly, solutions to those issues are often informed by established precedent and the research that has taken place beyond the domestic front. This makes it a wise idea to go for an MPH that holds its own on the national and international stage. So it’s important to look at outside resources when searching for a program, a place where you can find options that have been fully vetted and thoroughly reviewed, compared against competing schools coast-to-coast, and then hand selected. Although we have listed the schools by state, we didn’t try to force in any programs that didn’t fit. You will find that many states don’t have any schools that met our high standards and therefore didn’t make the list, while other states have several programs we felt were worth including. What’s left is the top tier of American public health schools, and the only ones we feel confident calling the very best. Council on Education for Public Health (CEPH) accreditation is a big deal for any school of public health. The council is recognized by the U.S. Department of Education as an approved accrediting agency for public health degree programs. No serious, competent MPH degree in the country is offered without first earning CEPH accreditation. In fact, graduating from a CEPH-accredited program is a requirement just to establish your eligibility to sit for the NBPHE’s Certified in Public Health exam. CEPH accreditation is not an easy bar for schools to clear. The 50+ page criteria outline covers a raft of documentation and standards that applicant schools have to supply and meet, covering aspects as varied as student engagement in departmental policy-making to school autonomy to student outcome tracking. As you can tell, it’s a broad set of standards that serve to prepare graduates for real-world practices in a complex field. CEPH accreditation ensures that a program has what it takes to produce MPH graduates capable of rising to that challenge. Because we’re looking for only the best schools, we dug deep looking at every CEPH-accredited MPH program, identifying the ones that bring together the elements we know mean the most to ambitious grad students. We considered how those attributes compared to all other schools across the country, and selected the ones we feel confident calling the very best. Among the most important points we considered were curriculum and the options for customizing it, the kind of research taking place at the institute, the experience and reputation of instructors, and overall value. Public health as a field and an area of study spans an enormous breadth of subjects, far too many for general programs to cover every possible aspect in depth. Concentration options offered as part of an MPH program provides students with an opportunity to focus on the specific area of concern that means the most to them. Of course, every CEPH-accredited program has a core curriculum that covers biostatistics, social justice and ethics, epidemiology, health policy, and the social, environmental, and biological aspects of health. This foundational knowledge can be complemented and built upon with more in-depth expertise in a chosen area of focus. So we looked carefully at the breadth and selection of concentrations offered at each school, from common options like biostatistics and epidemiological variants, to more obscure and emerging areas like public health marketing, biosecurity and gerontology. We also didn’t hesitate to highlight schools that are strong in just one particular aspect of public health education, whether it’s their analytical and quantitative approach to public health investigations or options that address working with highly specific populations such as Native Americans or Pacific Islanders. Building off of the concentration options are the dual degree offerings, the combination master’s programs that can make you the master of multiple different fields in one intensive course of study. Some also offer accelerated options that combine bachelor and master’s programs into a single five-year unit, a faster and less expensive way to an advanced credential if you plan your studies properly. We gave weight to those schools with a strong set of advanced degree offerings that could be earned concurrent with the MPH, and we listed all the duel degree options for each program that made our list. Public health is synonymous with deep investigations into everything from the causes and sources of disease outbreaks to how disease and even behavioral patterns propagate through communities. Naturally, epidemiologists and public health officials seek to understand these things in an effort to mitigate effects, prevent future public health threats, and, of course, to develop direct clinical and social solutions in the form of everything from vaccines to public health education campaigns. Much of this work takes place at the very same institutions that offer MPH programs. In assessing programs on the merits of their research contributions, we looked to see if they have strong research funding and respected research centers and initiatives, whether located on campus or otherwise run by faculty researchers. A school’s name can tell you a lot. When an institution has built a name for itself in the public health sphere over generations, its reputation often precedes it. As much as you and your employer might appreciate name recognition and the strong reputation a school might have, it’s really the reputation of the faculty that should mean the most to you when selecting a program. Reputations in academia are hard won so you can be sure if you have an instructor with a name you’ve heard before, it’s the result of an equally impressive background and the important contributions they’ve made to literature and research in the field. We feel that a deep bench of experienced faculty is the single strongest distinguishing factor for greatness in a public health grad program. Even if a school is lacking in the kind of name recognition that would cause it to be as familiar to someone in New York as it would be in Nebraska, they would still be a strong contender for our list if the faculty there were impressive enough to get our attention. No public health initiative is launched with a blank check, so anybody getting into public health policy and program management needs to have an appreciation for how to get the most out of every dollar spent. This could very well start with your appraisal of your MPH options and the decision you end up making about which one is right for you. Value is a measure of both quality and cost. As a grad student looking for the best program available, you certainly wouldn’t expect the best to also be the cheapest. You just want to know that you’re getting a great value for your education dollars. At the end the day, if a program isn’t able to offer at least as much as it’s competitors and do so at a comparable price, it wasn’t a contender for our list. We took a long and thoughtful look at all the CEPH-accredited programs out there, giving careful consideration to all these points, and distilling it down to this list of recommendations. Somewhere here, you’ll find the program that’s perfectly aligned with your own career goals and aspirations. As one of the leading public research universities in the country, USC is an obvious choice for an MPH degree that is heavy on the theoretical explorations of diverse questions of public health science. More than 100 multi-disciplinary faculty teach through the school, many of them engaged in cutting edge research projects that students can become intimately involved with. You can join them in their key role of developing initiatives that have a meaningful, positive impact on the daily lives of people in both local and global communities. Groundbreaking studies on the effects of air pollution on childhood lung function and e-cigarettes and youth have helped to shape national and international dialog and best practices for dealing with new threats. Centered between not just one but two major teaching hospitals on the vast USC Health Science Campus, you’re ideally placed to earn a degree with serious interdisciplinary credentials. When you graduate, nearly 400,000 current alumni on the national and international scene are part of a wide open network offering you contacts and input in almost any area you want to work in. UCLA doesn’t have the library of concentrations that other large universities offer in public health (although their broad selection of dual degrees, and articulated, specialist dual degree options offset this to a large degree), but a close look at the program reveals a thoughtful, in-depth set of highly focused specializations backed by world-class research and subject-matter expertise among the faculty teaching them. The program is also solidly grounded in the core mission of the Field School to build health and equity for all people. That mission is strongly evidenced in both the breadth of scope of research and active public health efforts spearheaded by faculty and students from the school and in the global reach of the program… MOUs with nearly 20 international educational institutions make overseas participation de rigeur for students in almost any specialization. The school’s location on the multidisciplinary unified campus at UCLA also creates many opportunities for interaction with professionals from other fields of study and cross-training aspects that you’ll be hard-pressed to find in other universities. It’s no surprise that UCLA Field School graduates have gone on to posts such as Minister of Health for Hungary and Taiwan, directorships of global and national AIDS prevention programs, and leading positions at WHO, NIH, the CDC, and other major centers of public health. UC Irvine may be a relative newcomer to the UC Public Health scene, only having achieved accreditation in 2012, but it’s quickly moved up in the pack in terms of both features and quality of education. A first-rate biostatistics concentration, run in cooperation with the Department of Statistics of the university’s School of Information and Computer Science, performs complex analyses of probability and distribution in conjunction with public health issues and outbreaks, and teaches students how to not only crunch the data, but also to communicate their findings effectively to non-statisticians. The Spatial Epidemiology Research Group is only one of the special offshoots of this collaboration, turning in stunning visual representations of data ranging from ovarian cancer rates in the state of California to rheumatoid arthritis in Sweden. The international flavor spreads out across the department, though, with global health studies forming an important component in every concentration on offer. Claremont’s unique position among American institutes of higher learning comes courtesy of a design modeled on that of Oxford and Cambridge Universities in the UK. Within walking distance of, and affiliated with, Harvey Mudd, Scripps, and the Keck Graduate Institute of Applied Life Sciences, CGS offers a highly collaborative and supportive academic environment. Your required internship will give you a chance to focus on the unique public health challenges found among the diverse communities of Southern California’s Inland Empire. But a local practicum is only a springboard to the global considerations that this degree is known for. Courses in the monitoring and evaluation of global health programs, health geoinformatics, and emerging chronic infectious diseases worldwide help give you the perspective to view disparate populations in a global community context. Research interests and projects led by the high-caliber faculty span both the globe and the world of public health concerns, including the health of migrants and indigenous peoples, substance abuse prevention, and nutrition and physical activity. There is no question that Yale graduates are the varsity squad of American public health experts. The School of Public Health at Yale was founded in 1915 and has a unique lineage drawing on both medical and non-medical academic sources, a strength that has consistently found faculty and graduates at the forefront of investigations into epidemiology, aging, and behavioral health on a global scale. Yale encourages students to customize their degrees to an unprecedented extent, so that the available concentrations and tracks serve as a springboard for a meaningful career in a particular area of focus. A strong core curriculum in biostatistical matters, social justice and ethical considerations will set you up for deeper, hands-on investigations in your chosen specialty, and you’ll have access to active experts working in the field through your summer internship placement. But with enormous resources come high expectations; you’ll also have to complete either a master’s thesis or capstone course to demonstrate what you’ve absorbed through the course of your studies, and the school’s reputation is on the line… you’ll be pressed to deliver your very best effort at this Ivy League standard-bearer. The University of Florida offers a strong set of core MPH competencies derived from recommendations from the Centers for Disease Control. That means you’ll start off with a firm foundation in statistical methods for health science, the principles of epidemiology, and environmental health concepts, among other key elements, regardless of what specialization you might choose. You’ll go on to build on that foundation through your elective concentration courses, taking on additional coursework under the supervision of subject matter experts in each area of study. Each faculty member at UF has a rich background in the field and remains heavily engaged in cutting edge research in their area of expertise… research that you will contribute to and benefit from. Investigations into chronic diseases and disabilities is a long-standing UF commitment, and offers one of the strongest areas of study in this program. Cultural competence is one of the hallmarks of MPH graduates from FAMU. The university puts extra emphasis on the honesty, integrity, caring, and respect that the program is designed to instill, values that lead directly into cultural sensitivity and a sense of social justice that will help you find the right touch no matter what populations you end up working with after graduation. FAMU expects you to demonstrate innovation, leadership, and technical expertise through the course of your studies here, and requires the completion of an applied public health research project on top of your normal 240 hours of internship service. For even more on-the-ground hours, you’ll also go through a public health rotation with the Florida Department of Health in your first year of study to see how public health work is performed out in the real world, and to give you exposure to the different aspects of that work. It’s a practical program with a high degree of experiential learning that drives home the values and practices learned in the classroom. As a top-rated American research university, there’s a lot of investigative and theoretical work to love at the University of Miami. Well-funded global research efforts led by expert faculty members give you plenty of opportunities to take part in cutting-edge investigations of public health issues ranging from the dengue and West Nile virus epidemics to the relationship between built environments and the social behavior and cognitive performance of geriatric Hispanic populations. The leadership and advocacy chops of those faculty are second to none and offer a shining example of ways to build your own public health career to match. But the inclusive culture at UM will draw you in even further than just the research. You’ll also find an intensive experiential capstone process waiting for you at the end of the program, a combined field experience and project that you can customize as a launchpad into your chosen career path in public health service. Community-based learning is a watchword at UNF, and it’s the perfect community to learn in… Jacksonville is a diverse, multi-cultural region with a strong healthcare industry presence that offers excellent opportunities to network and find internship opportunities directly associated with your own personal career focus. An integrated capstone and internship form your applied practice experience, spread over two semesters and 150 hours of field experience where you will demonstrate your competencies and put what you have learned in the classroom to use in the real world. The capstone includes a unique integrative learning experience component that can be completed entirely online, consisting of a comprehensive case study that puts together general public health skills with your concentration-specific competencies. It’s in keeping with the flexible, full or part-time, hybrid format of the program, which makes life easy for professionals who are continuing their education while holding down a regular 9 to 5. The collaborative, interdisciplinary approach adopted by the University of Georgia MPH program is a winning one for students in any public health concentration. It’s especially strong when it comes to the less conventional concentration options offered here, however, in the growing fields of gerontology and disaster management. With demand increasing dramatically for experts capable of dealing with the public health effects of major disasters and with the needs of an aging population, it’s no wonder the school has such a strong track record for finding job placements for graduates. With an experiential approach to education that involves nearly twice as much field work as some competing programs, UGA goes well beyond classroom learning to ensure you develop the real-world skills to succeed long before you get your degree. Sometimes a small school with a tight-knit group of faculty and students is exactly what you are looking for in a master’s degree program, and GSU fits the bill. You won’t have to worry about getting lost in the crowd or overrun by other priorities at this expert-led, evidence-driven MPH program in tranquil Statesboro, a town that made the top three in the 2017 list of America’s Best Communities. The school has an outsized impact on Georgia state public health, though, with studies into diabetic emergencies in state schools and depression in African American residents among their recent research subjects. The school is also strong in biostatistical research and data crunching, with the Peace Center representing a noted center of expertise for designing and conducting quantitative analysis on large sets of data. Located in the heart of Atlanta, home of the Centers for Disease Control and Prevention, GSU offers a practical public health education with extraordinary networking and experiential learning opportunities. The agency is one of the top employers of GSU alumni, and student and faculty research projects go hand-in-hand with current CDC priorities. Faculty are also very strong on the international public health front, leading global projects covering everything from urban health indexing to global tobacco control policy research. As a student learning under these professors, you’ll have exposure to the most up-to-date findings and have a hand in developing some of the latest techniques across the spectrum of concentration areas. You’ll also enjoy access to the superlative on campus research centers that serve as global resources in matters such as tobacco addiction studies and developmental disabilities. Few programs in the U.S. are as highly respected or as well-positioned to set you up with a long-term career in almost any area of public health. If you didn’t already know it, you’ll find out pretty quickly in public health that effective solutions began and end with understanding the population you are dealing with. Searching out programs that have a niche or concentration focused on the subject area you plan to work in can be the key to a long and successful career. And if you hope to make a career out of working with Pacific Islanders or other indigenous populations, then UH is one of your best options. With a Native Hawaiian and Indigenous Health concentration, you will achieve competencies in evaluating population health in a historical context, evaluating health proposals in the context of tradition and ancestral knowledge, and designing disease prevention strategies that balance sensitivity and science. On top of the strong core knowledge delivered on health promotion, biostatistics, and environmental factors, any of the concentrations available here will set you up for a strong entrance into the public health field. First, a note about credits; Northwestern offers one credit per course, an anomaly in both the typical semester and quarter credit systems used elsewhere in North America, so don’t be thrown by the high per-credit-cost. Ultimately, it converts into a fairly average 43 or so semester credits just like most MPH programs. But this is not most MPH programs! It’s a prestige program at a top-flight private research university with nearly $500 million in research funding. It’s located in Chicago, one of the premier medical and commercial centers in the United States, with a diverse faculty and student body. You’ll be diving into current research and practice areas under the watchful guidance of some of the most highly qualified instructors in the business, working in popular concentration areas that are becoming increasingly important every day. Offering only a single concentration allows the folks at UI-Champaign to really hone their expertise in teaching public health topics with a focus on that specialty area. Although your program will hit the same six core areas of public health that any CEPH-certified program will, the faculty at Champaign have realized that the public health field has even bigger foes than infectious disease… today, chronic disease such as heart disease, diabetes, and cancer, are far bigger killers than cholera, HIV, or Ebola. Consequently, the program here repurposes the same tactics and techniques used in infectious disease epidemiology, biostatistics, and policy to drill down on chronic disease. And, recognizing that chronic conditions are largely behaviorally driven, the sole concentration here hands you the tools to help change population behaviors that lead to unhealthy conditions. It’s a modern look into a changing field, and one that will give you the education you need to lead those changes. Although the MPH program is technically organized under the College of Veterinary Medicine at K-State, the reality is that it is a true interdisciplinary program, with governance and courses spread among six academic colleges, including arts and sciences, engineering, human ecology, and agriculture. Those close ties to other departments, and the location in the heart of the Kansas prairies, make the KSU MPH degree ideally suited to any student hoping to specialize in food or animal-related public health concerns. The food safety and biosecurity emphasis leads to competencies in policy, laws, and regulation surrounding food safety and offers a broad perspective on biosecurity and defense issues in food production and distribution. Your applied practical experience component will bridge the theory you pick up in the classroom with the on-the-ground challenges and practices you’ll need to succeed after graduation. You’ll also complete an integrated learning experience as part of your studies, either conducting public health thesis research or assembling and presenting a report in your field of study. Collaborative effort and information sharing are two of the qualities that make the UK MPH an outstanding option not just in Kentucky but throughout the South. With strong inroads and insights into the rural communities that typify the state, you’ll have opportunities to earn an understanding of populations that are notoriously difficult to reach with public health efforts. The school runs research centers that address issues as diverse as agricultural health and injury prevention, and cancer screening and prevention, all centered on the lives and livelihoods common to rural Appalachia. Through the Office of Practice and Workforce Development, the program offers strong ties to regional, national, and international public health agencies to offer experiential practice opportunities for students. But the rural focus doesn’t mean low-tech; the Center for Innovation in Population Health is investigating machine learning and artificial intelligence approaches to biostatistics that rival those at any big-city school. LSU uses a competency-based curriculum to help prepare students for success in a range of public health roles including practice, research, and teaching. As part of that curriculum, you’ll go through practice experience at a local, state, or national organization dedicated to delivering public health services or research in your chosen field of study. But you will have plenty of exposure to theory as well as practice. As a research-centric school, LSU focuses on studies that feature innovation and offer high impact across a diverse range of topics. That includes the critically important and highly topical study of lead contamination in drinking water sources and more off the charts subjects such as the SILLY Study… a project that isn’t silly at all, instead delving into the esoteric subject on the Study of Insulin sensitivity in Low-birth weight Louisiana Youth. With both federal and private funding behind such programs, you will find a lot of opportunities to get your hands dirty in research projects with real-world effects. A culminating experience will wrap up both aspects of your training into a coherent interdisciplinary summation that integrates your knowledge and training in an exercise that will fully prepare you for the exigencies of real-world public health work. USM doesn’t offer you a half-page roster of available concentrations in public health, but what it does give you is a precise, competency-based education in public health management, an option with few peers in either New England or the rest of the country. Nationally recognized faculty members ply you with knowledge, share their applied research, and tap you for assistance in program development projects to give you an executive-level perspective on the kind of demands and job duties faced by today’s public health administrators. Outside projects that the school currently is engaged in include a Children’s Health Insurance Program Reauthorization Act Demonstration Grant, Patient-Centered Medical Home Evaluations, and the Maine Rural Health Research Center, investigating health care access and financing among the rural population of New England. Unusually among schools of public health, the University of Maryland is quite proud to claim an unfair advantage for their graduates… located within the Capital Beltway, the school enjoys unparalleled access to both major federal public health agencies and regional, national, and multinational NGOs. That means you have access to internship opportunities that are unique to Maryland, not to mention networking with the top tier of public health officials and experts. This proximity also hyper-charges the school’s Lecture Series, which features big-name speakers on a variety of public health and other related topics. But you won’t just be sitting around listening to lectures at UM; the school also has a robust investigative portfolio with a backbone running through more than a dozen highly respected research centers like the Maryland Center for Health Equity and the U.S. D.O.A.-funded CONSERV, which serves as a national resource for reducing the agricultural water challenges facing the country in coming decades. Your opportunities for both education and career-building are wide-open at UM. Format: On campus, with some concentrations available partially online in a hybrid format. The 45 credit option is available only to candidates with prior qualifications, and not all concentrations are available in both tracks. Chan School graduates have been at the forefront of global efforts in eradicating smallpox and Guinea worm disease. They lead hospitals and health care agencies, including the WHO and CDC. They’ve even developed life-saving vaccines. One of them even went on to become Prime Minister of Norway. Although running a small Scandinavian country may not be in your future, it should give you some perspective on the caliber of faculty and students you’ll take your place among if you’re accepted to this elite program. The network you will find there is priceless, but so is the education: you’ll have an opportunity to take part in groundbreaking research through initiatives as diverse as lung cancer studies and health care financing, tackling the challenges of public health on every front. The world-class caliber of Harvard studies leads directly to a program that has unsurpassed opportunities for global study. A year-long practicum leading up to your capstone project can take you anywhere in the world, from the remote Zuni reservations of the American Southwest to South Africa. You’ll learn from the best at Harvard, and when you graduate, you’ll be one of them. 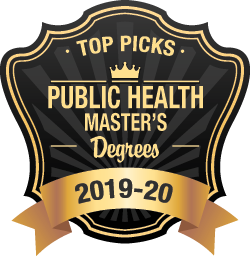 If you’re looking for a school that can deliver on the realities of public health work in a challenging urban environment, there’s no better choice you can make than Wayne State for your MPH. Located in the heart of Detroit, the school has made a special study of the difficulties and special techniques required when working in heavily urbanized populations. The unique Public Methods in Urban Health concentration reflects that focus, with specialized courses offered in applied research methods for urban environments and how to conduct community level interventions in the city alongside more traditional classes in biostatistics, health assessment, and epidemiology. Faculty have honed their own expertise through research and practice both in and outside that area of study, with current research projects exploring cutting edge interventions for pediatric obesity using smartphones, investigating the behavioral drivers behind binging among female survivors of sexual violence, and HIV prevention and outreach services for African American sexual minorities. If you’re one of those overachievers who just can’t get enough information, then Saint Louis University may be the place for you… with the ability to tailor your MPH with joint concentrations, you can double up on the hard-hitting Jesuit-style curriculum, and probably impress future employers twice as much. On top of that, the college has a unique portfolio and focus, studying the intersection of social, environmental, and physical factors that determine the health and well-being of both individuals and communities. That means you’ll be rubbing shoulders with faculty and future professionals in diverse fields such as urban planning, social work, criminology, and applied behavior analysis, giving you a unique view of the public health field from the outside in, as well as offering insights into practices from other disciplines that can advance the cause of public health and welfare. If your focus is research, you’ll be sure to appreciate the on-campus research centers, diving into topics from pediatric mental health services in Africa to social services in American Indian communities. If you have more of a policy bent, then the Clark-Fox Policy Institute is the place you’ll want to be, tying evidence from all those research programs into larger public policy initiatives to deal with the most pressing issues of the day. It’s all part of the process at WUSTL—you have to understand the problems in order to create the solutions. With big-time research funding and globally-respected faculty, this program is equipped to prepare you for success in every aspect of public health, from administration to biostatistics to social influences. The innovative curriculum design includes specific training in transdisciplinary problem solving, giving you multi-faceted perspectives on complex and current public health challenges. Partnerships with local agencies like FamilyForward and Better Family Life gives you a chance to put that training to use in real-world outreach projects, making a real difference long before you get to graduation. Rutgers could rest on its laurels as one of the best public research universities in the country, but instead it is breaking new ground in the public health field with the first accredited LGBTQ health concentration in the country. Tied in the with the school’s Center for Health, Identity, Behavior, and Prevention Studies, a leading HIV, substance abuse, and mental health research institute, the new concentration addresses the growing need for health and health-related practitioners who are capable of managing the unique and challenging health needs of that population. But just because Rutgers has a cutting edge perspective on new fields of practice in public health, it doesn’t mean they are neglecting more traditional studies. In particular, Rutgers is known for the rigor required in both the biostatistics and epidemiology programs, where a quantitative skills assessment is required before you are allowed to enroll in certain core courses. Whether you plan to enter the trenches on the perpeturally-contested front lines of epidemiology or get into the fight in new and untested realms of behavior and identity, Rutgers has the education you need to become the best. Montclair’s MPH program combines the core features of a CEPH-accredited public health program with a strong focus on social justice. New Jersey is a diverse state and the student population here is built to reflect that, including students from every economic, cultural, and professional background. That sort of diversity is a strength in an educational setting where you can learn as much from your fellow students as from your award-winning instructors. The practice-oriented, population health-focused program here produces culturally competent professionals who have gone on to work at some of the biggest agencies in the public health field… and at some of the smallest, most exciting, most innovative niche agencies. You get the tools and skillset to do it all at Montclair, and the support that you will need to set off on the career path of your dreams. Groundbreaking research, real-world experience, and a diverse community in an exciting and tight community in the high desert of New Mexico… and all of it at some of the most affordable tuition rates out of any of the schools on our list. What’s not to like about earning your MPH at the University of New Mexico? The three available concentration options are all front-and-center in areas of the greatest concern to public health officials today, and the school’s vision of improving health through population-centric methods primes you to take on leadership roles in almost any arena in the field. The diversity of ideas and people you are surrounded with here strengthen your skills in research and service while delivering a sound knowledge base in the latest theories and information. Since it’s New York, you have a ton of different schools to choose from. But at NYU, you do more than just learning the rote elements of public health services… you have the opportunity to help up-end those paradigms and advance the course of the profession first-hand. The NYU program dives head-first into the advantages offered by its location at the center of so many global public health efforts, maintaining close ties to UN health agencies as well as the mammoth New York State and City departments of public health. You’ll learn from award-winning faculty with a wide-ranging array of active research initiatives, from HIV epidemiology to new methods for sampling and processing biostatistical data. Partnerships with agencies like WHO, UNICEF, and UNFPA create opportunities for you not only to enter internships with global impact, but to work with data and policymakers who are shaping those efforts on a daily basis. There’s almost too much to choose from among the 20 different centers, labs, and initiatives and 10 different concentrations, but whatever path you take, you will find the support and resources you need to become a leader in the field after graduation. Studying at a world leader in medical and scientific training in the heart of New York City is one sure-fire way to jump start your career in public health, and the Icahn School of Medicine is the place to do it. With breakthrough research projects, a global focus, and revolutionary interdisciplinary teamwork, all of it going on in modern, state-of-the-art facilities, at Mount Sinai you can get one of the most comprehensive educations available today. The wide selection of concentrations are backed up by deep expertise at every turn; your biostatistics specialization, for example, means a lot more when you get it on a campus ranked by Fast Company as one of the most innovative in the world in the field of data science. And if you are diving into outcomes research, it’s handy to be studying at a medical school that serves more than 3 million patients annually. With the big names and big ideas floating around the halls at Mount Sinai, you’ll find doors opening in every major public health organization in the world when you show up with a Mount Sinai diploma in hand. You just know a SUNY school is going to turn up somewhere on a top list of American public health programs… the New York State University system is a big one and attracts top talent to a thriving region of the country with deep investment in medical and health concerns. For our money, SUNY-Stony Brook may well be the best of the bunch. With three focused concentration areas, the school offers a reasonably diverse selection without spreading itself too thin. With the only academic health sciences center on Long Island, the school has a firm lock on collaborative arrangements with regional partners such as the Brookhaven National Laboratory, and close affiliations with Stony Brook University Hospital. The emphasis on multidisciplinary education and research combined with community service rests on those partnerships and on an expert faculty from across the spectrum of public health disciplines. UB places a strong emphasis on field education, with placement opportunities at more than 65 regional agencies and even more choices through the school’s Global Health Initiative. The school participates in public health projects on four continents, giving students and faculty the chance to study things like malaria child mortality rates in Uganda and pediatric environmental epidemiology in Peru. The school is also known for a focus on interprofessional education in the MPH program, putting students from different health professions together for a mutually beneficial exchange of perspectives and information – an opportunity that will build and shape your character and skills for a lifetime! UB is also strongly tied in with the World Health Organization, hosting the WHO Collaboration Center on Health and Housing, a facility assisting in the research and technical aspects of how a built environment fosters the health and happiness of people with different abilities. The school also runs the Population Health Observatory, a dedicated training and informatics center that dives into the gritty aspects of biostatistical and computational data mining to further research in public health. ECU’s mission is to expand the workforce that addresses the contemporary public health challenges in disease prevention and long-term health in the Carolinas. A special focus on minority and elderly residents is part of the rigorous course of academic study at ECU, and it goes hand-in-hand with collaborative research projects that the program is involved in that examine everything from obesity to cardiovascular disease to diabetes. You’ll get a rigorous and engaging course of study in the five basic competency areas of public health as well as an in-depth dive into your chosen concentration option, all taught by respected, expert faculty with a deep interest in both your success and the overall improvement of the public health field. It’s a combination that makes for competent, well-trained graduates, and you can be one of them. Case Western is a powerhouse in the data-heavy field of quantitative and population health research. Using publicly available databases and electronic health records, students in the Population Health Research concentration dive deep into statistical programming methods that other schools barely touch for a coder-level perspective on data crunching at the Institute for Computational Biology, the Center for Statistical Research, Computing, and Collaboration, and other campus centers. It’s a major advantage in the digital age, as is the location of the university itself: University Circle in Cleveland, a concentration of educational and medical institutions such as the Cleveland Clinic and University Hospitals of Cleveland that offer ready access to medical professionals and reams of all-important health systems data. Of course, the proximity to those major health care centers is also an advantage for the other concentrations that Case Western has on-tap. The school’s innovative IRP, Intensive Research Pathway, is available in any of those concentrations and prioritizes research opportunities over practice for students whose goal gravitates toward scientific inquiry or academia. Offering a full slate of in-demand public health service concentrations and providing highly relevant practicum opportunities for each of them, selecting the University of Cincinnati is a real no-brainer for students in the Tri-State area. With close links to area health departments and research sites and cutting-edge on campus research facilities like the Center for Biostatistical Services, expertise is always on hand in any given specialization for you to learn from. A unique offering among those specializations is the Occupational Public Health concentration, which combines the statistical and preventative aspects of traditional public health services with the workplace safety and treatment aspects of occupational medicine into a laser-focused program that provides training for future leaders in corporate medical departments, insurance companies, and occupational medicine practices. Interdisciplinary education is the watchword at the University of Oklahoma Health Sciences Center. Under the umbrella of the center, experts from biology, epidemiology, statistics, and other disciplines come together in a variety of research and educational efforts that combine to offer you among the most well-rounded public health degrees you’ll find in the U.S. With a diverse population in the state itself, you have the opportunity to gain real experience and expertise in dealing with diverse health and cultural challenges. The tight connections the university maintains with outside agencies through initiatives and centers such as the Southwest Preparedness and Emergency Response Learning Center leads to real world engagements in public health actions and preparedness that other schools are hard-pressed to match. Major university initiatives in the area of American Indian Health also offers insights and training to prepare you to work with an underserved and frequently neglected population right here in the U.S. The Center for Biosecurity Research offers research and projects aimed at enhancing protection against biological weapons and infectious diseases, another niche that OUHSC fills in the national public health scene. Drexel is a comprehensive private research university with a global reputation and a role model for translational, use-inspired research projects. The school is a leader in experiential learning activities, a focus that fits well with the CEPH-mandated requirement for MPH programs to include applied practical experience… at Drexel, the entire fabric of the university is designed to support those experiences, rather than them being simply tacked on to meet an accreditation requirement. Standards are high for those experiences, requiring placements that have both sufficient depth of learning and breadth of activities. Additionally, your required culminating experience, the ILE (Integrated Learning Experience), may be satisfied through either completing a relevant public health project or through an internship embracing multiple projects. The school’s wide array of overseas partnerships and diverse international project involvement makes it a snap to gain global experience no matter what concentration you are focused on. Integrated with a world-class medical center, the TJU College of Population Health is built for interdisciplinary education in public health. You’ll rub shoulders with future doctors, pharmacists, lawyers, and other professionals focusing on the medical community as you use the dozens of on-campus centers, labs, and institutes through the course of your studies. Through the cutting-edge projects at the Sidney Kimmel Cancer Center, the school has become well known for its expertise in cancer research. It also makes great efforts to accommodate students on different professional tracks, with the accelerated LEAP (Leaders in Evidence, Application, and Prevention) completion track designed to train students heading for professional degrees in other fields in the essential elements of public health… all without requiring a vast time commitment to complete the degree. The Ivy League has long been an important contributor to both American and global public health efforts, and Brown’s School of Public Health fits right in with that tradition. With important on-campus research centers like the Brown University AIDS Program, the Center for Health Equity Research, and the International Health Institute, you will find plenty of active, on-going research in almost every public health field under the sun. That research is being conducted by award-winning faculty who are at the top of the field, leaders in behavioral and social sciences, biostatistics, and epidemiology who you will rub shoulders with an learn from directly in a system with an unprecedented 2:1 student/faculty ratio. With those connections and Brown’s global reputation, you can find yourself on an internship project in Bangladesh or Brazil, or working out of World Health Organization headquarters in Geneva on pressing international public health problems like migrant healthcare challenges. Brown also encourages cross-disciplinary training and individual customization, so your ability to take classes outside your field or to customize your course plan to meet your own interests is unfettered. Vanderbilt is built on a longstanding tradition of public service. Graduates have occupied high government offices at both state and federal levels continuously since the early 1900s. So it’s no surprise that more recent alumni have taken up positions with the Tennessee Department of Health, the CDC, and at various public and private hospitals in leadership roles than graduates of any other area school. The Vanderbilt MPH program goes out of its way to produce graduates of the caliber that can take on big challenges and succeed. It’s all done through innovative education and a strong research organization that actively involves students in advancing knowledge in the field. A mandatory thesis requirement serves as your integrative experience, requiring substantive and original work that demonstrates your ability to think critically, analyze systematically, and communicate clearly… all the skills required to become an active leader in the field after graduation. Graduate Archer Fellowship Program offer the opportunity to live, learn, and work in the heart of Washington D.C. There are many advantages to earning a master’s in public health degree at a specialized medical university, and you will find all of them embodied in the University of Texas Health Science Center MPH program. A big program that is fit for a big state, the UTHealth degree is offered in six different locations around Texas, each with its own dedicated faculty, but courses may combine all that expertise depending on concentration so that you can receive best-of-breed instruction regardless of your location. The flexible culminating experience gives you the option of either completing and defending a paper or participating in a capstone course. The school also offers flexibility in its approach to your required 180 practicum hours, which may be completed entirely at one site or in multiple locations depending on your choices, and your goals. With so many major universities taking the top spot for public health programs across the country, it’s refreshing to find a small school that has the chops to offer meaningful research opportunities and unique courses alongside the traditional benefits of a more boutique college. Small class sizes are a Westminster signature, and one-to-one interaction with faculty is a tradition at the school. Flexible schedule and personalization of assignments only add to the ways that make Westminster the better choice for students who don’t want to feel like they are being pushed down an assembly line. Unique courses with surprising depth, such as SAS programming, allow you to tweak your program to offer a level of specialization that even formal concentrations at other universities can’t match. As a relatively recently established program, the UVA MPH has had the luxury of establishing itself from the beginning in a way that most MPH programs are only now moving toward… a consciously interdisciplinary course of study, staffed by faculty from across fields of expertise who have meaningful insights into the various aspects that go into modern public health work. The school has also built the program from the ground up to include a meaningful Applied Practice experience that places you in the field performing volunteer or service work to gain exposure to real-world practices and concerns in the profession. The program also includes an Integrative Learning Experience as a capstone event, a course in which you will complete a final project poster and paper detailing the outcomes of the research project you undertake over the course of the program. With many collaborative research efforts spanning other world-class UVA departments, you will have plenty of opportunities to engage in cutting-edge investigation into public health problems and learn from leaders in every field along the way. You really need to buckle in when you dive into an MPH program with the kind of breadth and depth the University of Washington offers. One of the preeminent research universities on the West Coast, with close ties around the Pacific Rim as well as through the Mountain West, UW offers a dizzying array of concentration options and the expert faculty to teach them. There are no compromises here, from practicum offerings that put you right in the heart of community and global public health efforts, to research opportunities that take you to the cutting edge of cancer, epidemiological, and ecological investigations where university and associated private researchers are breaking new ground each day. Not only do these opportunities give you direct experience in industry innovations that will be important for the duration of your career, but they also put you in touch with some of the most important individuals working in the field today… both faculty and classmates are bound for great things, and they’re only a phone call away. No matter what aspect of public health you hope to specialize in, you’ll find the concentration offered through the UW MPH program, all backed by the kind of specialized expertise you would expect from a top tier institute. Midwesterners are famed for their practicality and focus, and those are exactly the qualities you can expect to find at the UW-Madison MPH program. With only a general degree on offer, you won’t stray far from the core competencies of public health practice, outlined through robust coursework and driven home with a significant experiential component. You’ll be required to keep a portfolio during your practicum services, which you may rely on during your mandatory culminating Integrated Learning Experience, a final course to synthesize your acquired knowledge with your on-the-ground skills to put together theory and practice in a final package to demonstrate your understanding of the field.